A special thanks to Marc S. for sending me the NOS fiberglass pictures. There were several reasons why Ford moved Shelby's operation from Los Angeles closer to Detroit. 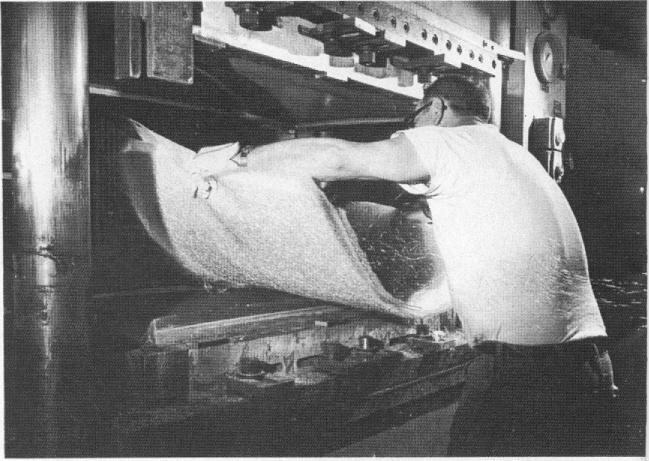 One of these reasons was problems with fiberglass production. AO Smith Corporation specialized in the manufacturing of a product called Fiberglass Reinforced Plastics (FRP). 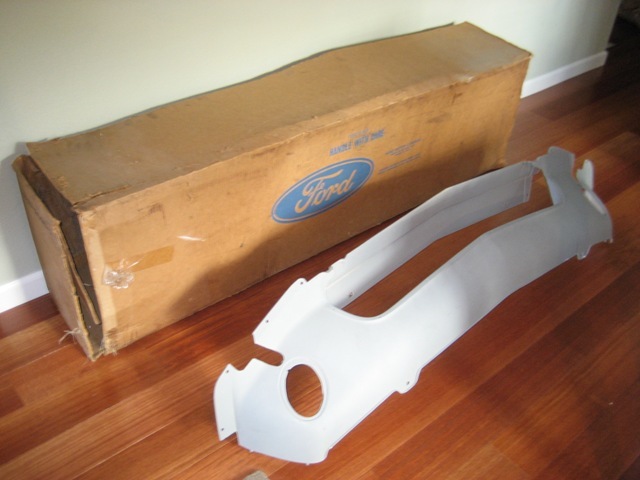 Smith made fiberglass for many of the big three automotive manufacturers. They made toppers for Broncos, Chevrolet Corvette bodies and even furniture at one time. 1968 Shelby fiberglass is unique to this model year. 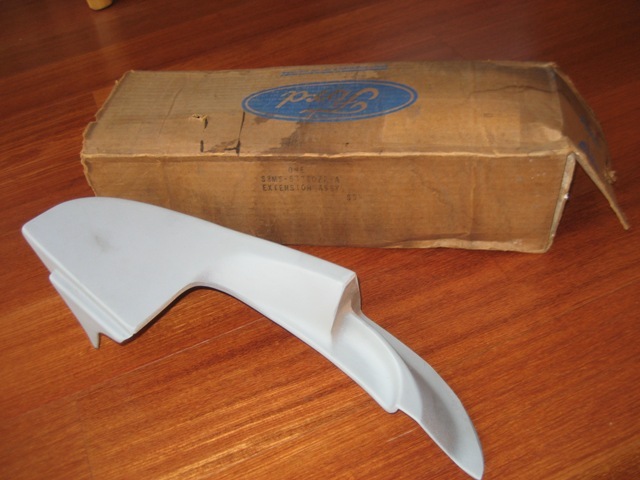 Today, original fiberglass is difficult to find. 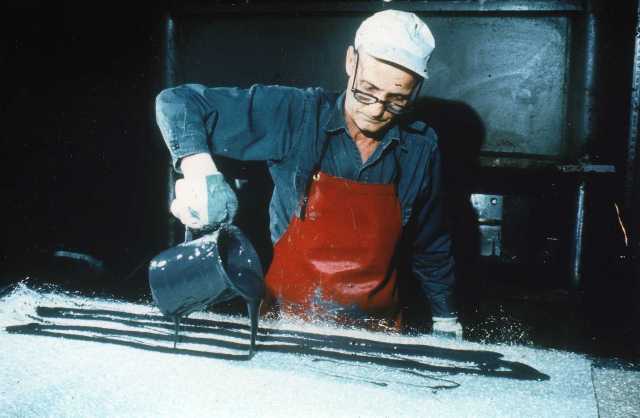 Here John Wright supervises the mixture of the FRP resin. 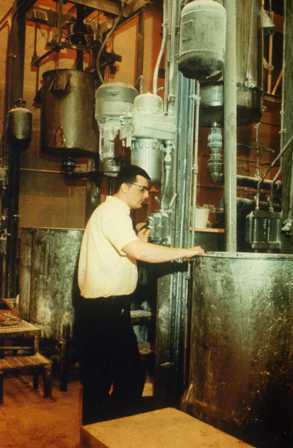 The original agreement had Smith producing 8,000 Shelbys during 1968. Additionally, they would produce parts for all the California Specials built on the west coast. 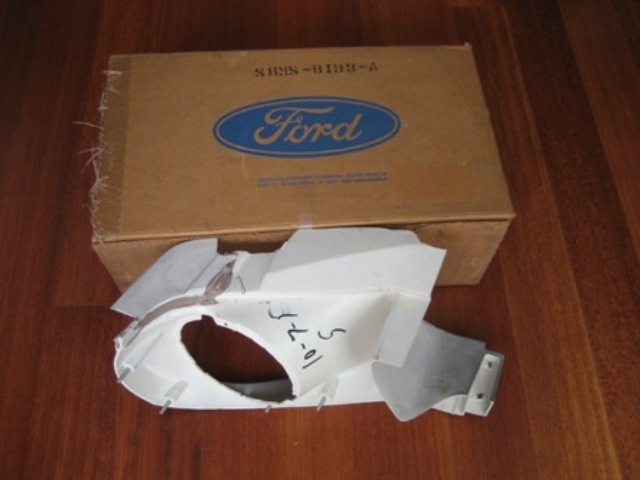 Smith supplied engineers, draftsmen and assemblers for Ford/Shelby. The finished surfaces or "outside material" was originally designed by Shelby. Smith was responsible for the inner surfaces and engineering the finished parts. Because there was a large volume of fiberglass in 1968, there is some variation in the products. Typically, the fiberglass has a smooth white or pink appearance. The smooth finish is created by the heat process used to form these parts. The "finished surfaces" are primer gray followed by the body color. Be careful, because some reproduction fiberglass is also pink in appearance. You can see here the headlight bucket is actually constructed of two pieces. The reddish material is a bonding agent used to glue the parts together. In the case of headlight buckets, the service parts do not have a rivet on the side. 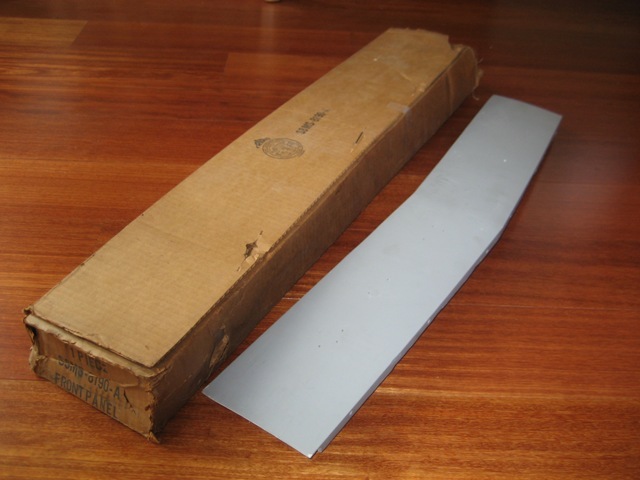 The rivet was used in concert with the bonding agent on production parts. This is a dream come true for someone looking for headlight buckets. It will be your lucky day if you find these. The lower valance is often damaged on many cars. These are extremely hard to find in any condition. Early versions of this panel sometimes show an exposed fiberglass matting on the backside. I supect these hand-laid parts were used before the metal dies were completed. The early style valances are not correct for most cars. The upper panel is the one that carries the "SHELBY" letters. Together these four parts make up the nose of a 1968 Shelby. This panel is largely unsupported and prone to damage by anyone that leans on the car. 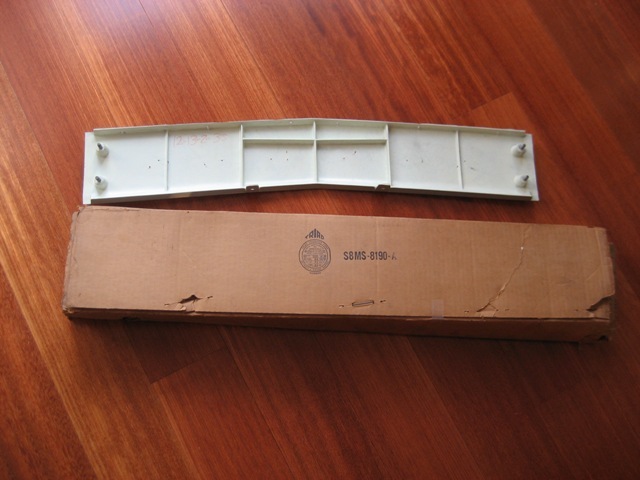 It carries part number S8MS-8190-A. The bottom side of this panel does have some ribs and two small tabs. The tabs are connected to the hood latch support with a metal bracket. There are a few different versions of the hood as well. The hood is actually several pieces bonded together. 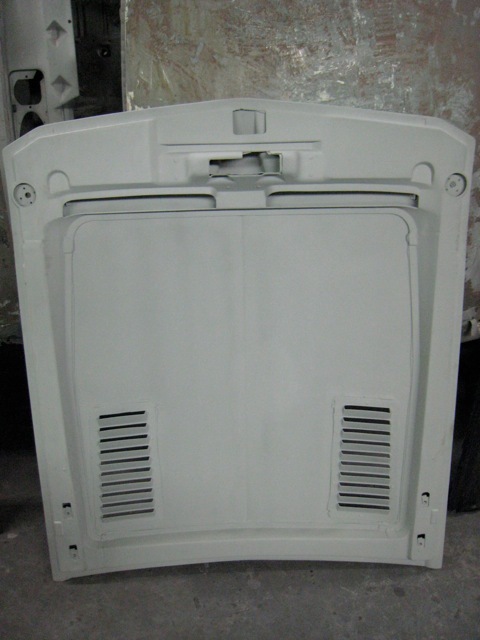 Early hoods may not have support bars on the bottom shell, immediately behind the scoop openings. The GT500 KR has a plenum that is bonded and riveted to the hood with a petal style rivet. This is often referred to as a ram air hood. Many people incorrectly believe ram air was an option on GT500s and GT350s. It was not. 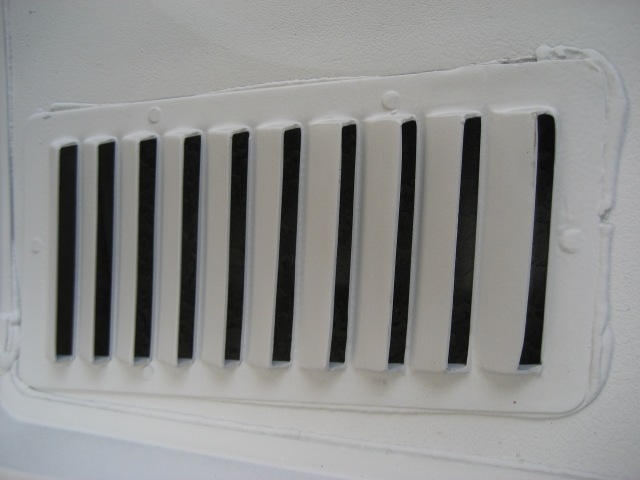 The hoods vents are actually separate parts bonded in during the manufacturing process. 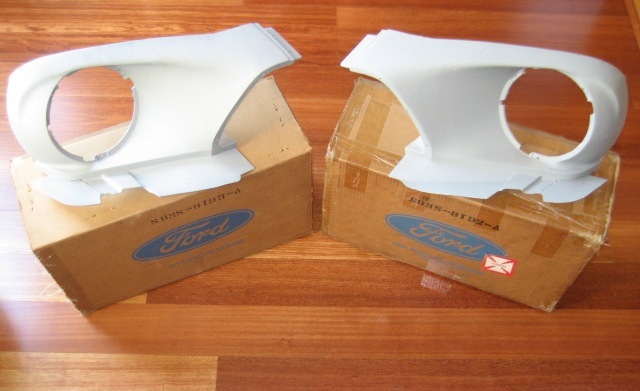 There are several variations of the quarter panel end caps as well. Some people say the convertible and fastback caps are different. Based on what I have seen it's likely they are from different molds. These caps were also used on the California Specials to create the spoiler. End caps and body side scoops were sealed to the body with a clear silicon caulk. The tail light panel also has several variations. The design was tweaked slightly during the year. Most of the differences are barely noticeable. They tend to be things like changes to the radius of a specific curvature. 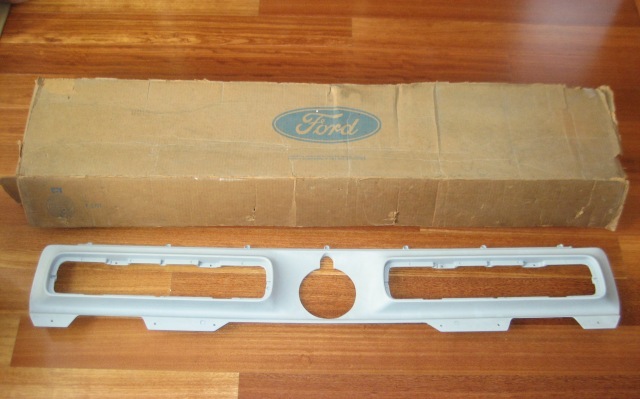 All 1968 Shelbys had this panel painted Ford Argent. The Argent color was used by Ford for many years to paint things like wheels and trim. This panel is also shared with the California Specials. 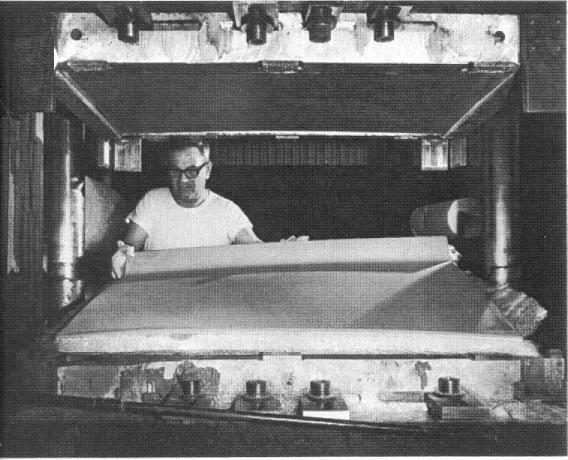 These pictures are from 1969, but the process for molding the FRP is the same. 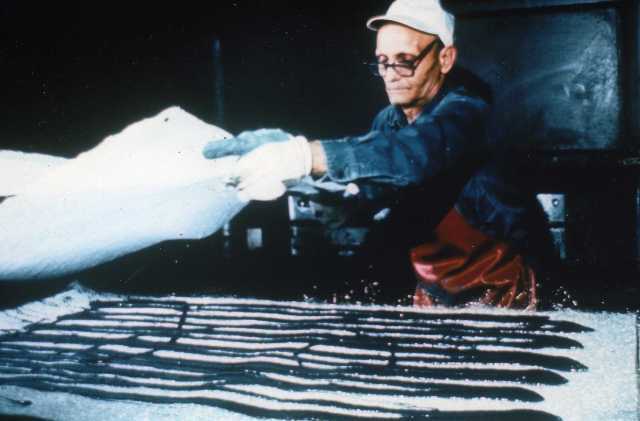 Ceville Evans, a AO Smith employee, pours the polyster resin mixture on to fiberglass mats. The mixture of mats and polyester resins were made into a measured sheet. 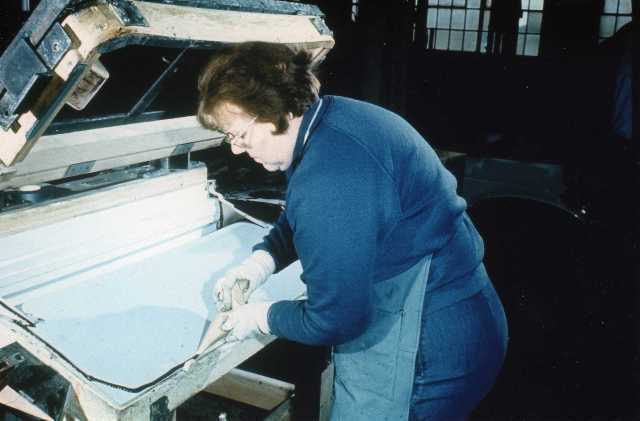 The sheets are placed into the metal die press and heated as they cured. After a short time, the finished part is removed. One advantage to the molding process was very little sanding. 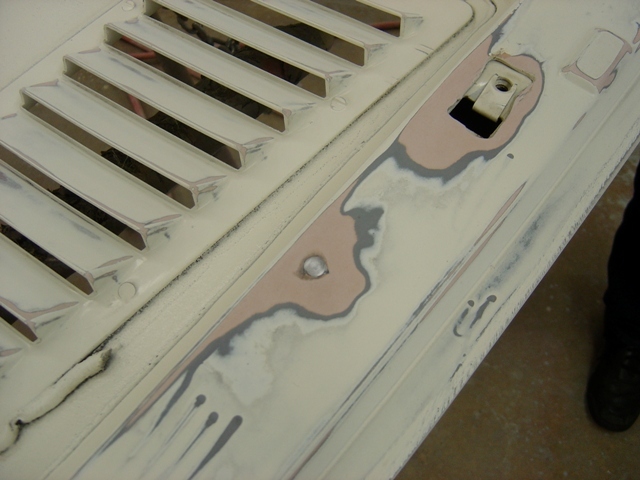 The thin pink (or white) coating is actually a primer. 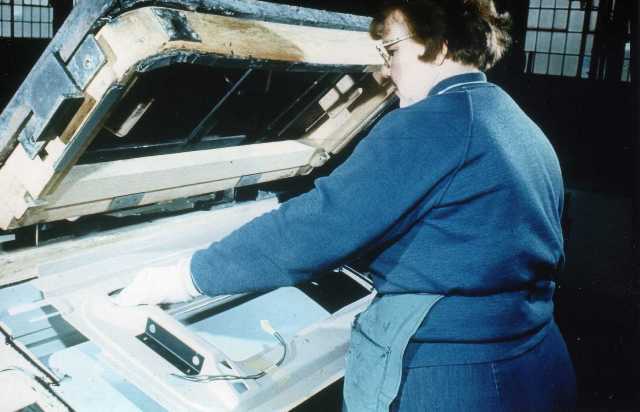 Here another employee places bonding agent around the perimeter of the upper skin for a 1969 Shelby decklid. This is a jig to align the two halves together properly. The bottom section of the decklid is placed into the jig. You can see how the trunk light wires are taped. Smith often left the wires taped to the decklids when painting. When the tape was removed, it left a bare spot on the bottom of the decklid. This is also why you often see paint on the wiring. We are not entirely sure how 1968 parts were painted. 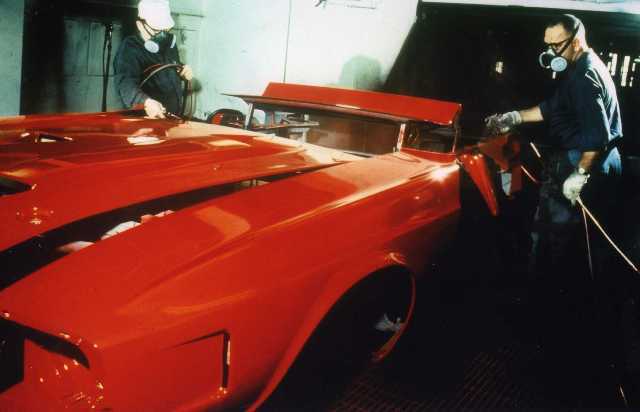 This photo shows the 1969 parts being painted. They are arranged on a table that moves down the line. All of the new fiberglass parts for this Candyapple Red car are on this rack. We do know that 1968 parts were also prepainted and then assembled on the 1968s.